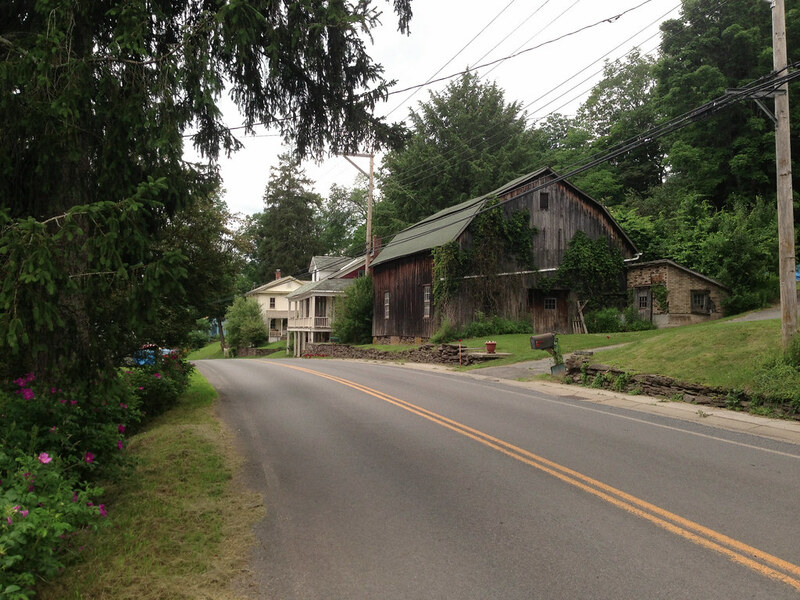 I grew up spending summers in Bloomville, in Delaware County, NY. Although I never lived here full-time and now only spend a couple of weeks here each year, it nevertheless occupies a special place in my heart: I’ve known it since infancy, it has left an indelible mark on my development. Summer entertainment revolved around goings-on in the nearby villages: the county fair, the town barbecue, local farm auctions. 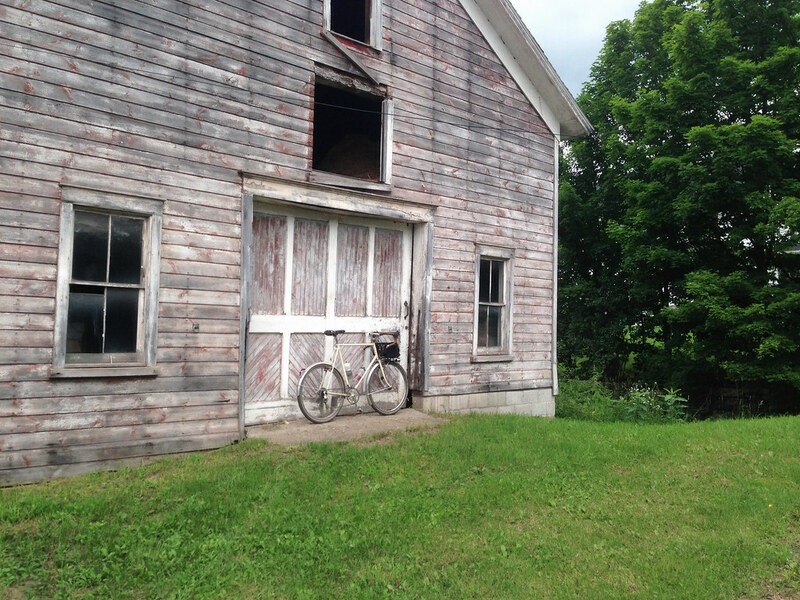 I recently rode a hilly 45-mile route that connects three neighboring villages to retrace childhood memories; each holds fond memories for me. But more relevant to this post, cycling between these villages is a fun adventure in pass hunting– the sport of riding over mountain passes towards a goal of having completed a defined number of passes within a region. Popular in France (rules of the game), it’s gaining popularity here in the US. It’s sort of the cycling equivalent of hiking clubs, where the goal is to have hiked over a defined group of mountain peaks. So instead of following major roads between the villages that skirt around and thereby avoid the mountains, I opt to ride up and over the mountains along the most remote, least traveled mountain passes and carriage roads I can find, choosing dirt over pavement wherever possible. 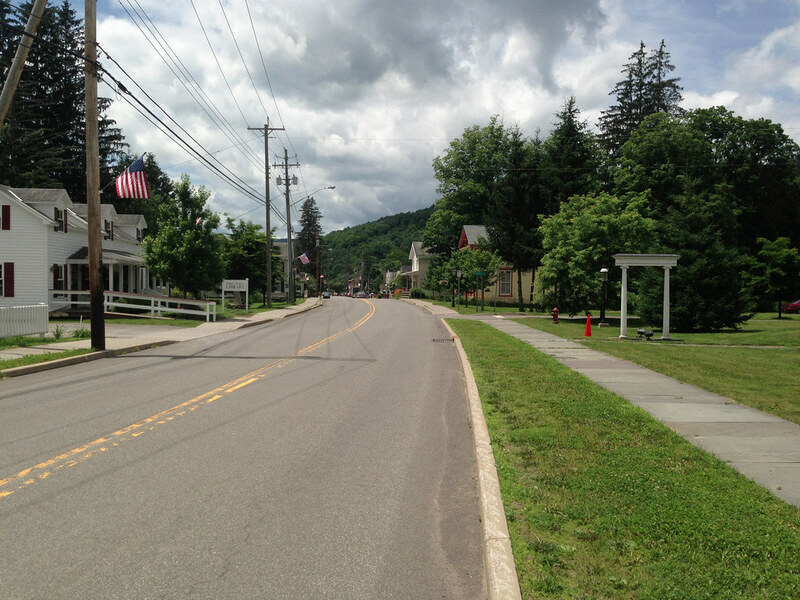 The route starts, like my previously described route, at the trail head of the Catskill Scenic Trail in Bloomville, a convenient location because of the parking and the proximity to the village center where one can find food and beverage. 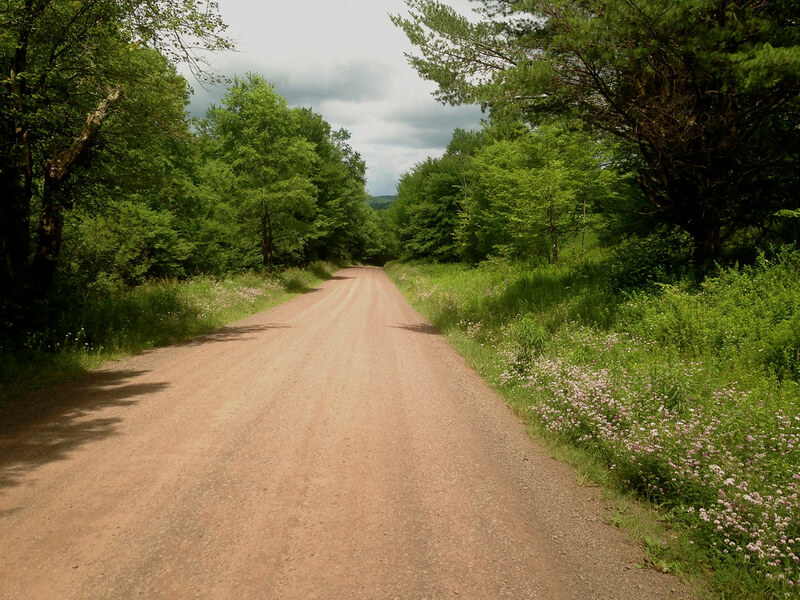 But unlike the previous route I described which takes in some of the trail and dirt roads north of it, this route doesn’t include any of the trail. 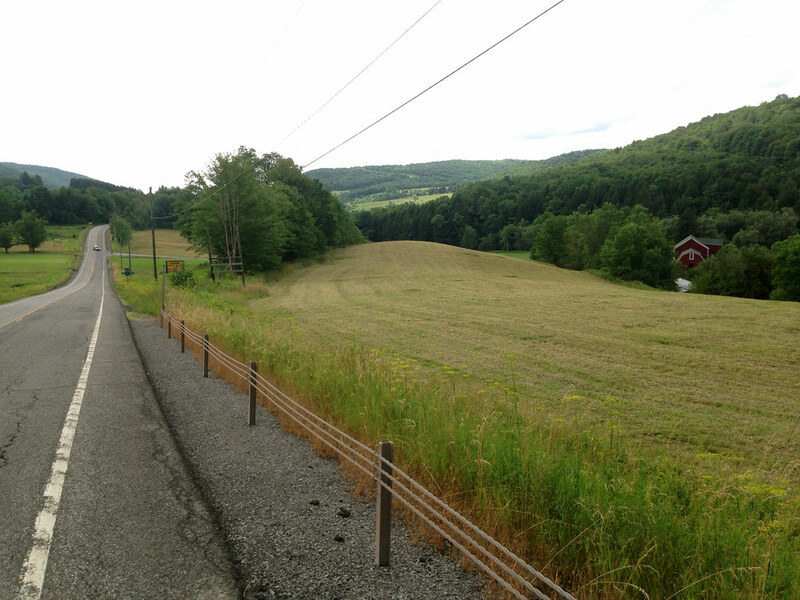 Instead, I head the few hundred feet on NYS Rt 10 into the village. Bloomville was once a bustling town with a thriving economy, fueled by the regional dairy economy, the railroad that ran through the village, and the mill powered by Wright’s Brook, which also runs through the village. Bloomville had several imposing hotels. The passenger railroad station is long gone. A second railway depot used for transporting food and grain was shuttered decades ago, the structure still stands today. 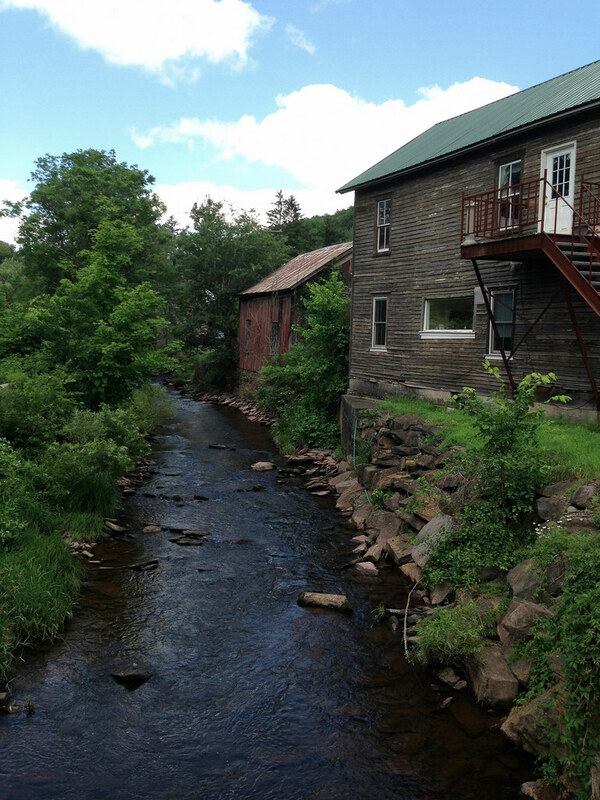 The mill had closed long before the railroad. The town steadily declined and what remains now is not much more than a crossroads with crumbling buildings with fading facades, skeletal reminders of its industrious past. 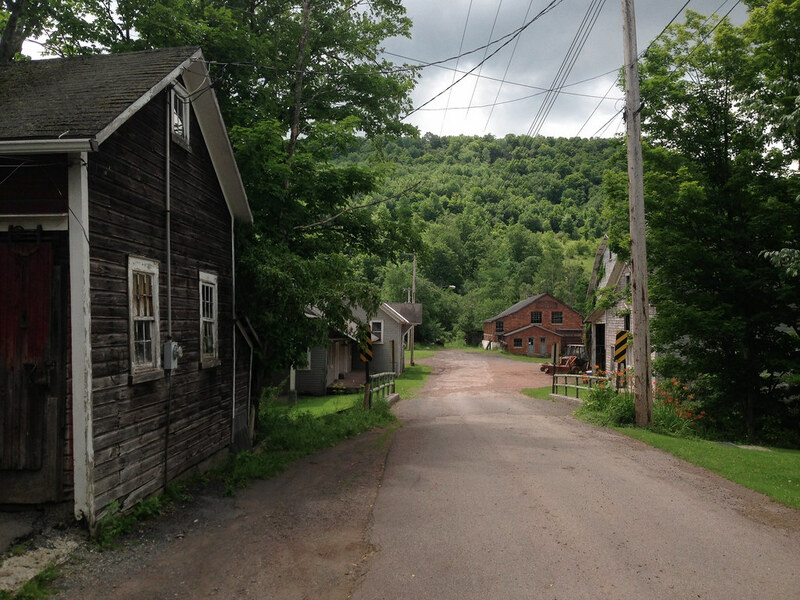 But Bloomville, and the Catskills, may be experiencing a form of economic revival, but more on that later. 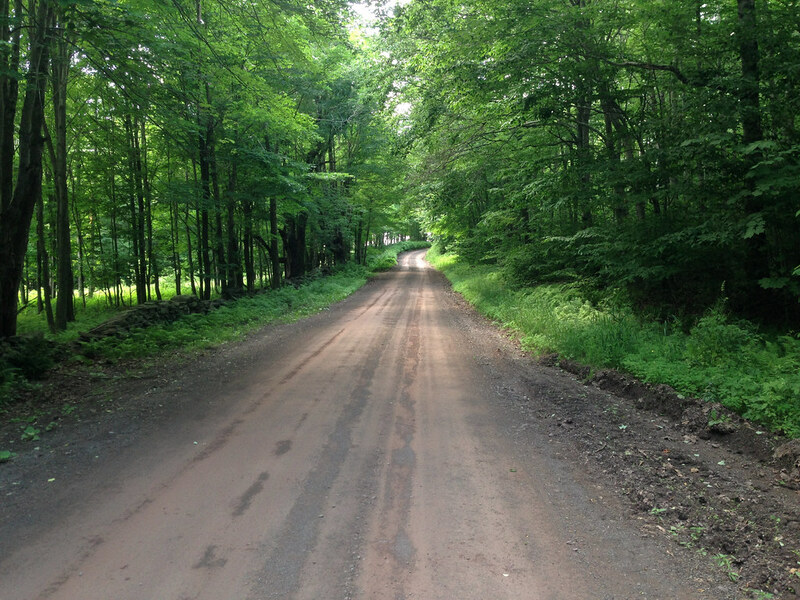 From Bloomville I head past the cemetery and across the river to County Highway 18 (Back River Rd), the gently rolling road dotted with roadside farm stands that follows the West Branch of the Delaware River. 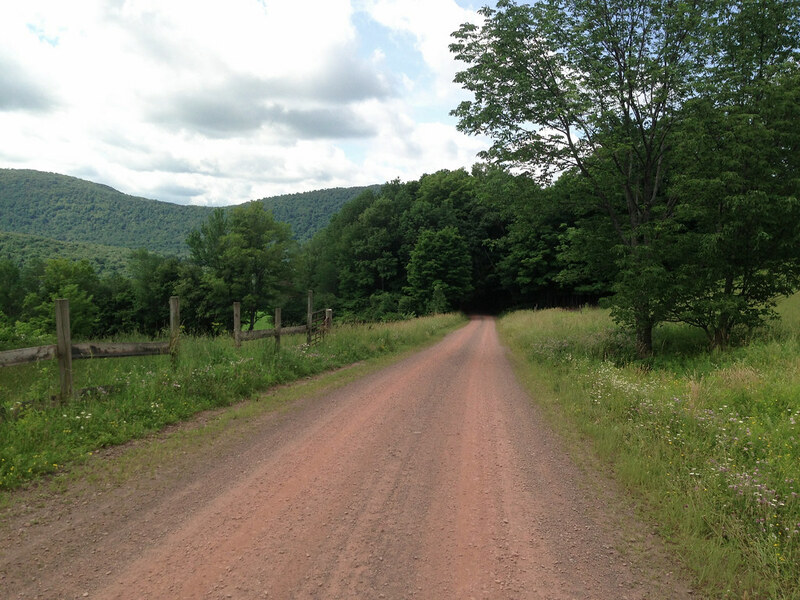 I turn onto Bramley Mountain Rd, a steep dirt road that takes me up Bramley Mountain into Bovina. At the top, the road becomes paved, views dominated by hilltop pastureland. 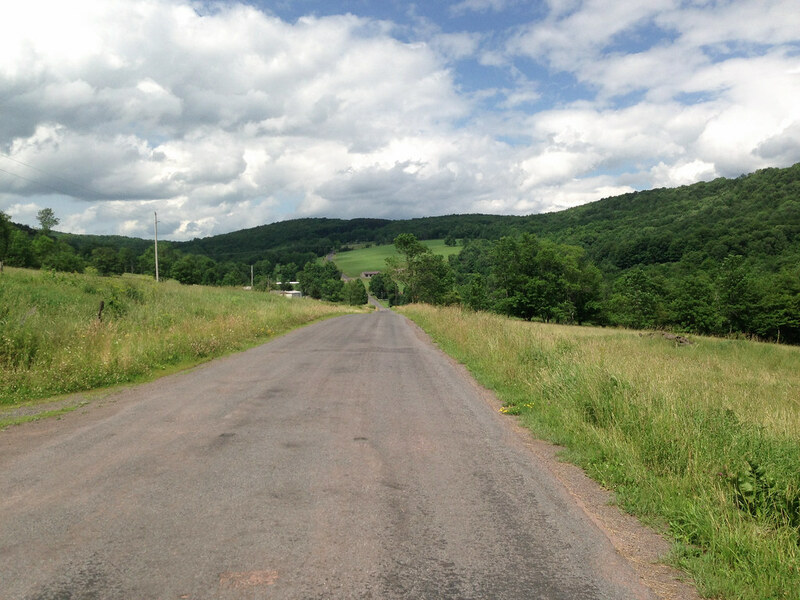 I turn left onto Miller Ave and follow a long and delightful dirt road descent all the way into Bovina Center. 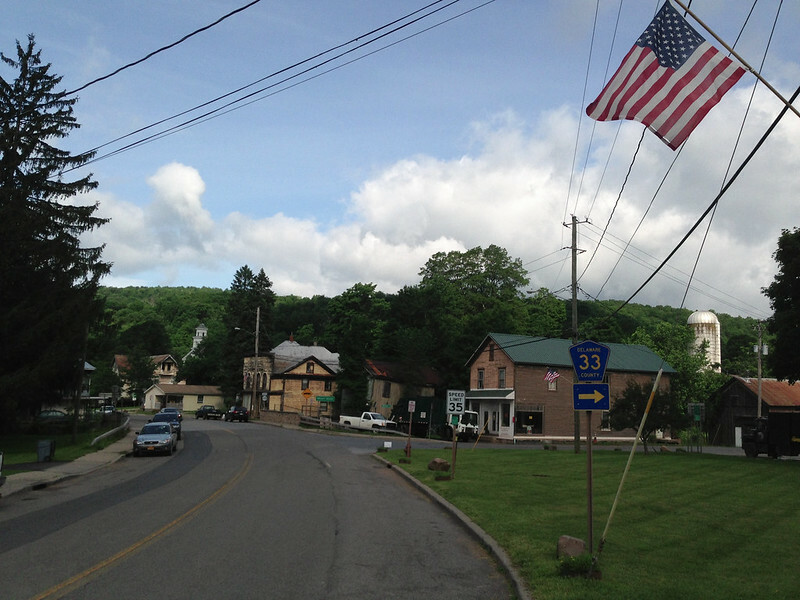 Like most of Delaware County, Bovina was predominantly (and is still, to a limited extent) a dairy farming town, with its village center spread along County Highway 6. 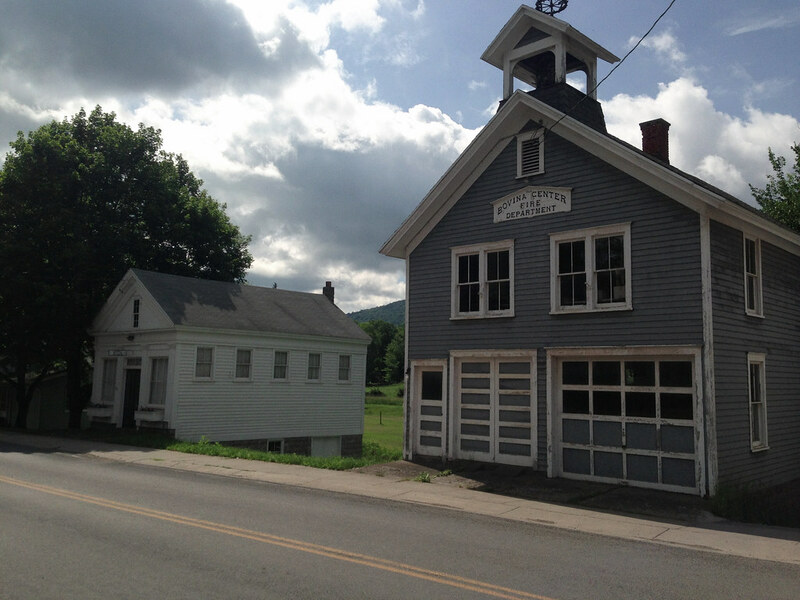 The white one-room building on the left in the picture below is the Bovina museum, which was closed when I passed by; I had wanted to stop in and learn more about the town’s history. At the other end of the village is Russell’s Store, a general store and eatery that dates back to 1823, with its current name dating back to 1919. It appears as though little has changed since then except the contents of its shelves. On Saturdays they host a Farmer’s Market. Speaking of Saturdays, that was the big night out for my family. 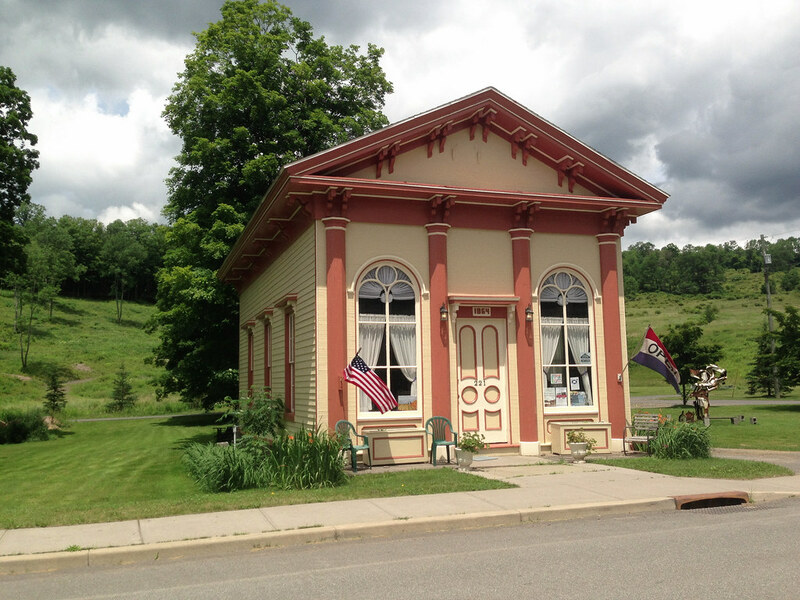 My mother was an obsessional antiques collector, and Saturday’s were when the weekly auction took place in Bovina Center. Held in a former creamery building on Creamery Rd just off of Main St (the orange brick building at the end of the road in the photo below), it was the biggest shindig in town. 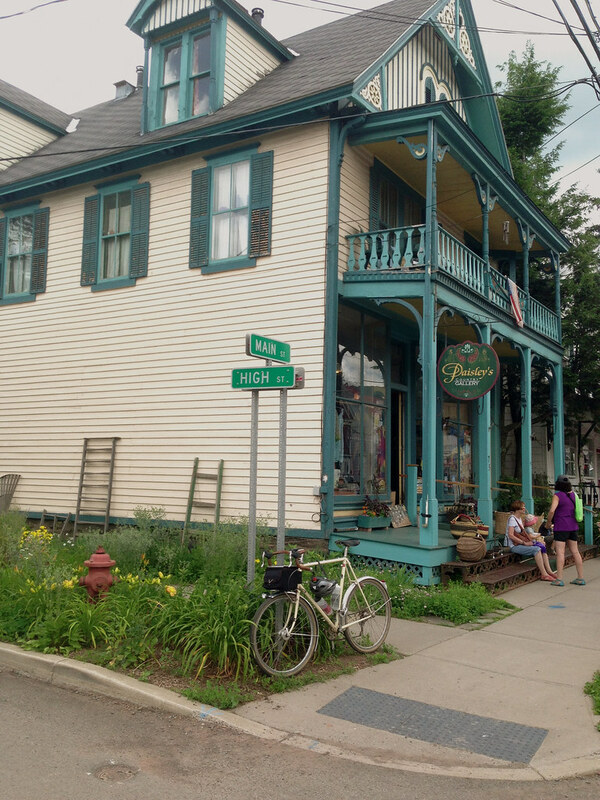 For many years the creamery was the main clearinghouse for the local auctioneer, every square inch of wall space was taken up by things that never sold– tacky flea market art, crushed velvet portraiture in baroque plastic frames, that sort of stuff. It bordered on surreal, an epicenter of kitsch. In the anteroom in front, you could buy hot dogs and chips along with your $1 entry ticket. Auction goers sat in old wooden school chairs, resting their hotdog boats on the built-in writing tablets. The auctioneer, as if deity, had his own raised pulpit, from which he would deliver his own sermon, the auctioneer’s shtick. Sadly, years ago the business relocated to another village, and the funky vibe got lost in the move. At least it’s good to know the business is being carried on by the next generation. 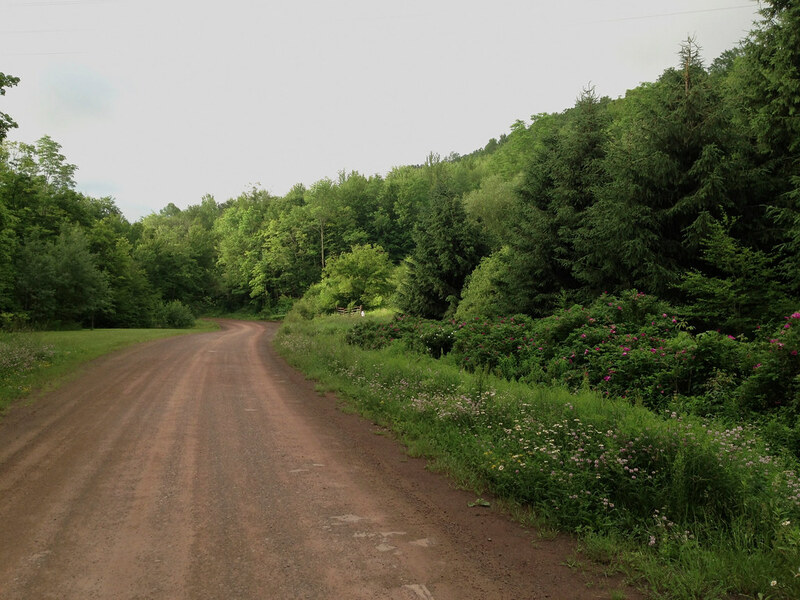 I head out of the village in the opposite direction of the next town on my route to take in one of my favorite dead-end dirt roads, Reinertsen Hill Rd. 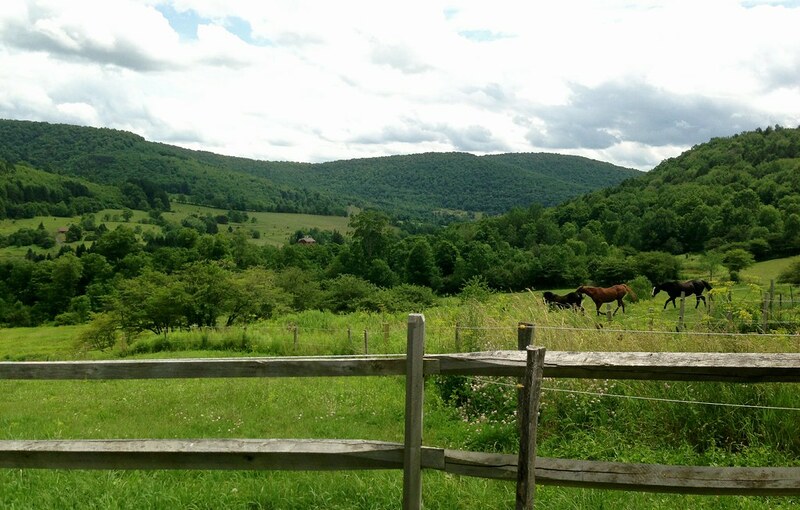 I know I’ll have to double back and head through Bovina Center again but I can’t resist the views. It twists up a steep hill testing the traction limits of my 650B Hetres. I come upon a field where a tractor is bailing freshly cut hay. 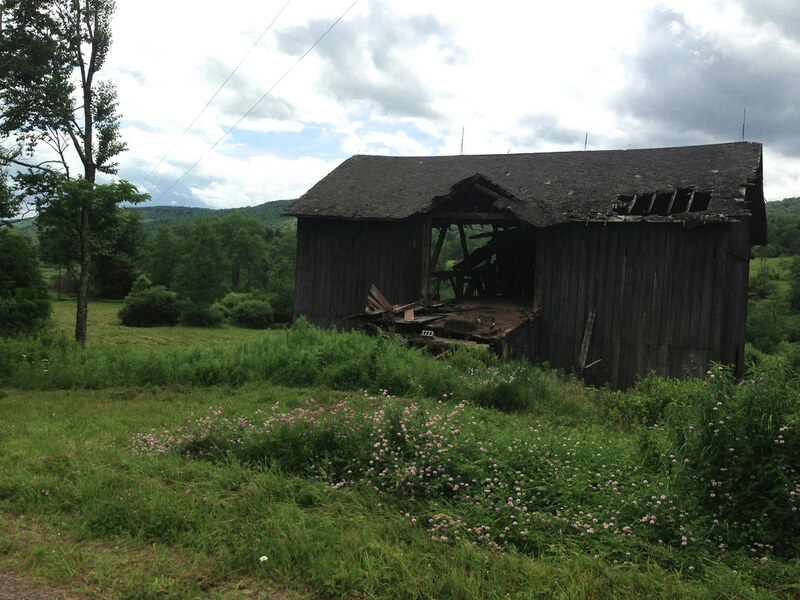 Past it, an abandoned barn. The road narrows, tree crowns converge and provide a welcome canopy. 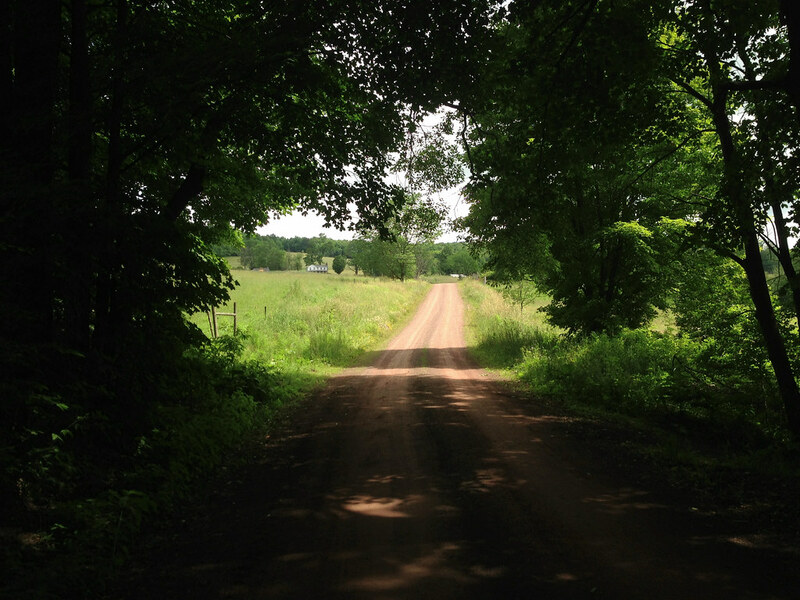 A clearing emerges, and the road dead-ends at a farmhouse. 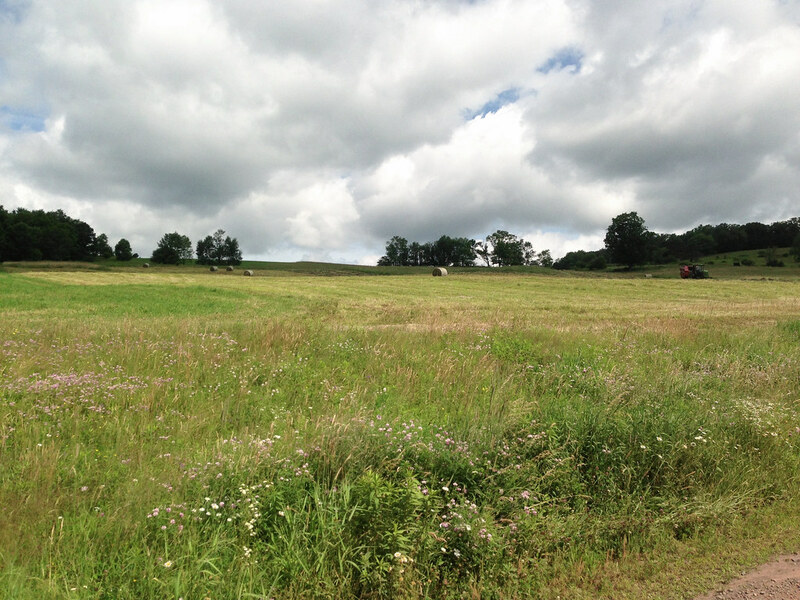 Cows graze in a field. Turning around and heading back down the hill, a new vista unfolds with every turn. I could devote an entire post to this short dead-end road, but I’ll stop here. 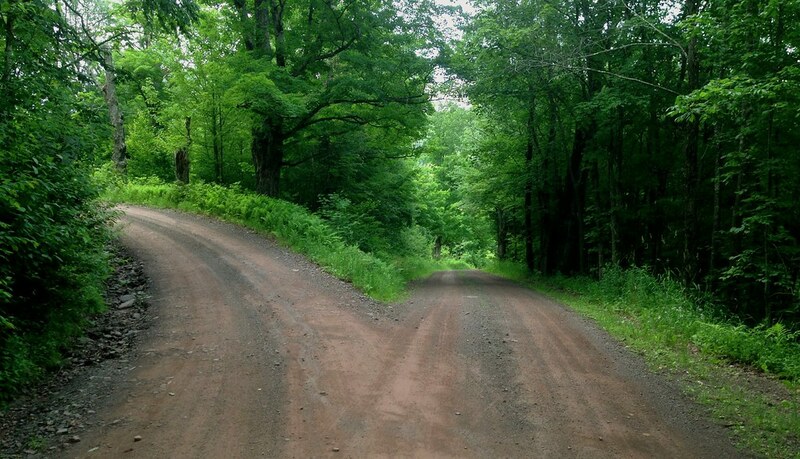 Back at the bottom of the hill, I continue away from Bovina Center on County Highway 6 toward another favorite dirt loop, Coulter Brook Rd. 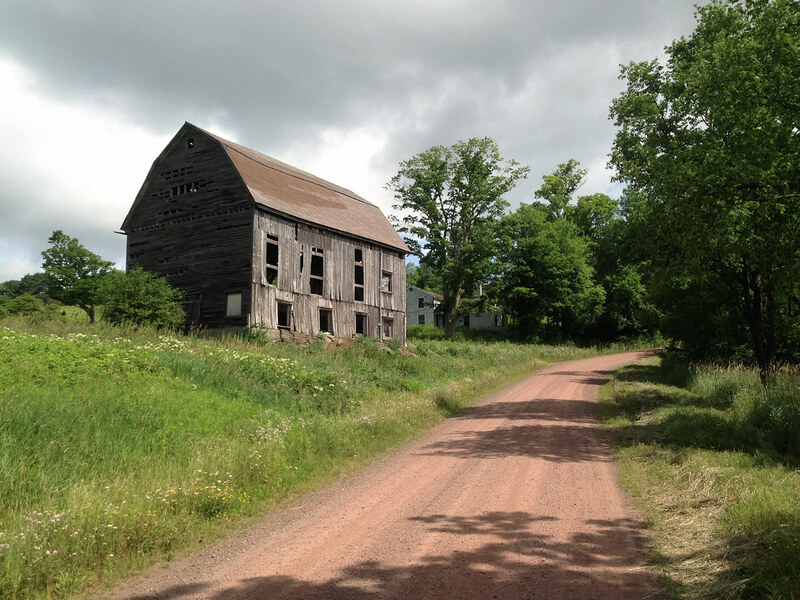 Highway 6 has gentle rollers with more of the usual views– farms and barns, in various states of decay. 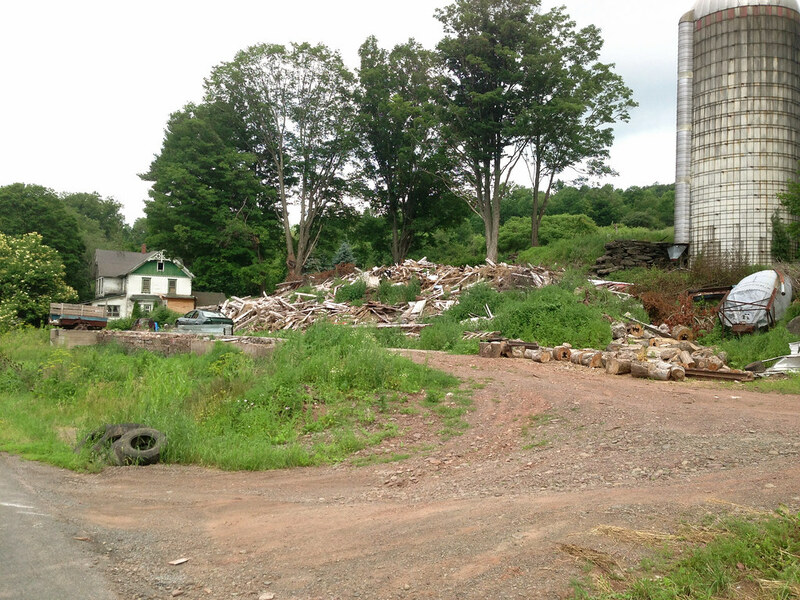 I pass one barn that has collapsed to rubble, a sad but common site around here (our family barn suffered the same fate, after decades of “deferred maintenance”). 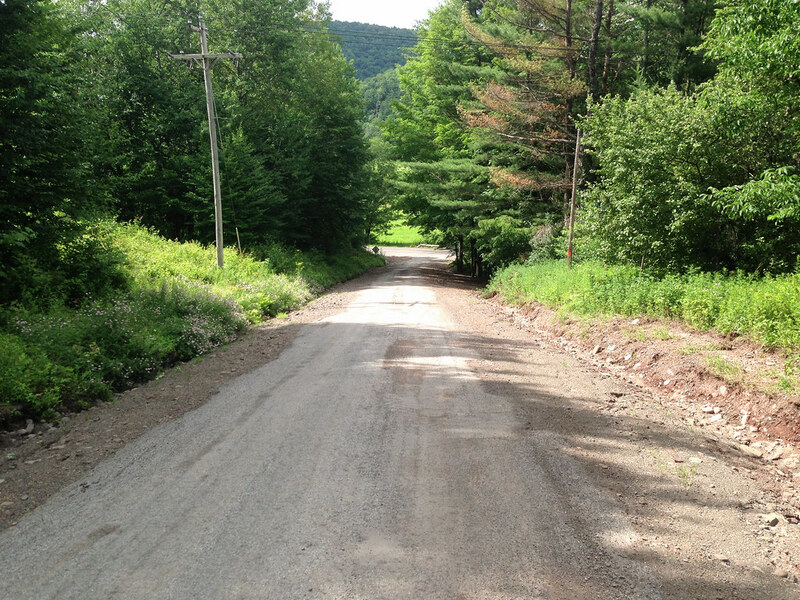 I turn onto Coulter Brook Rd, which loops back to Bovina Center. On my way back through the village, I stop at Russell’s store and refill my water bottles. For anyone riding this route, Russell’s may be a good food stop, and there’s also the swankier bakery/cafe on the other end of the village. More opportunities for food and drink lay ahead in the next village on the route. 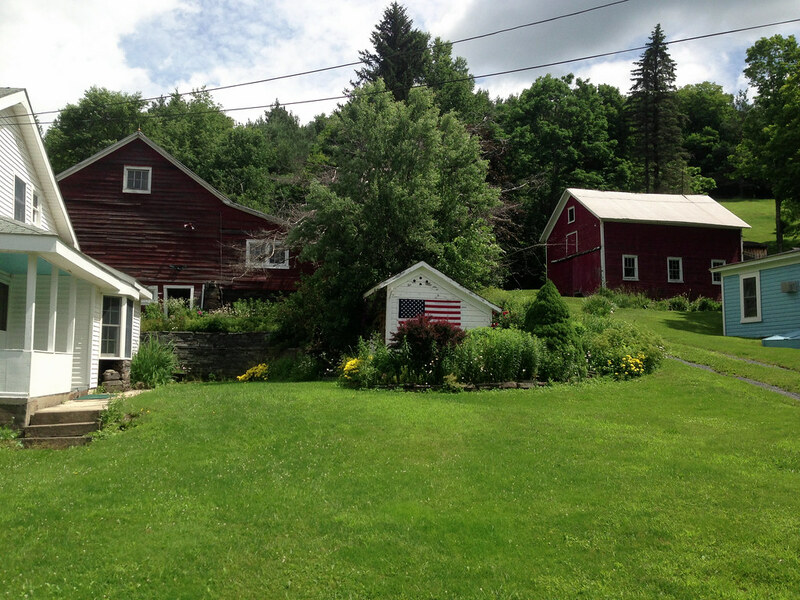 It’s July 6th, and American flags vye with barns for iconic dominance. Outside the village center, I turn onto Russell Hill Rd. This dirt road winds its way up a steep road that will take me to the next hamlet, Andes. 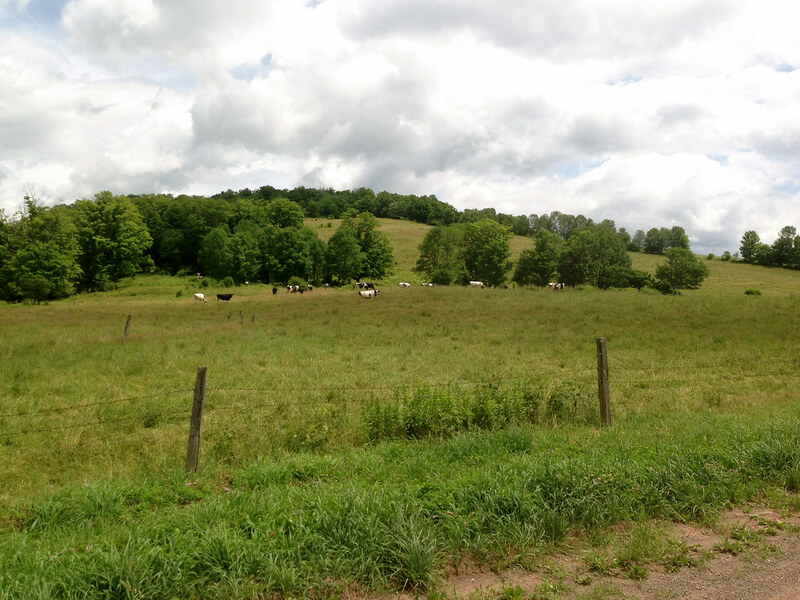 As I crest Russell Hill Rd, cows pasture on the hilltop. I enjoy a long, steady descent down the other side. At first I believe I’m heading down the hill to what must be Andes, but I soon discover I have many short but steep climbs to tackle before I make the final descent into Andes. I noted in my previous post that the sound of water was pervasive. This week it was less so, as we hadn’t gotten any significant rain for the better part of a week. But as rain gave way to sunshine, wildflowers flourished, decorating the sides of the road like confetti. 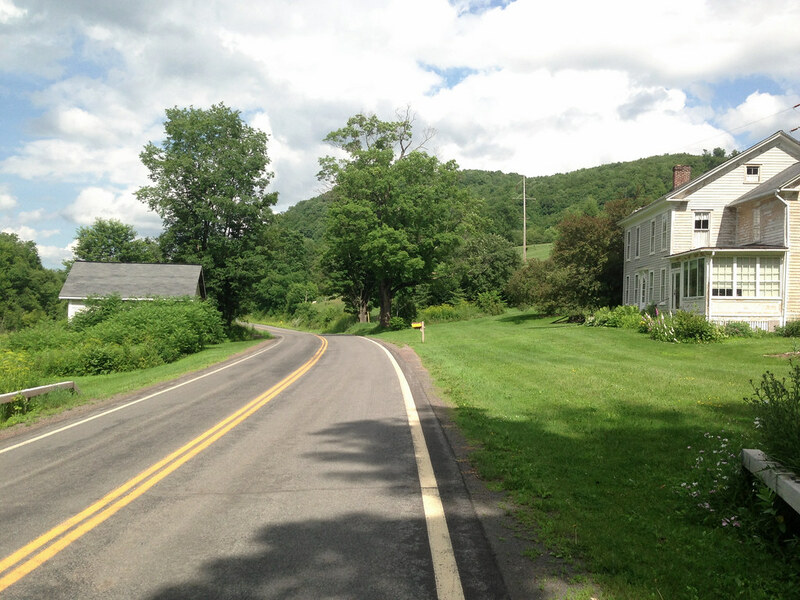 I’m supposed to fork left at Doig Hollow Rd, but I miss the turn, there are no markings. But I’m also going at a good clip, intoxicated by the breeze and by the unique sound of the voluminous Hetres swiftly rolling over packed dirt (imagine the sound that briefly lingers after a basketball bounces, but imagine it lingering indefinitely). I blow past the fork, which in retrospect should have been impossible to miss. This costs me precious hill climbing reserve: I descend a good 1/4 mile before realizing my mistake. As I ride I have no idea how much elevation gain this route has, I hadn’t mapped it online first (no internet access at my summer house). I was old-schooling it with a paper map from 1974. I do know, this far into the route, that it’s hilly! 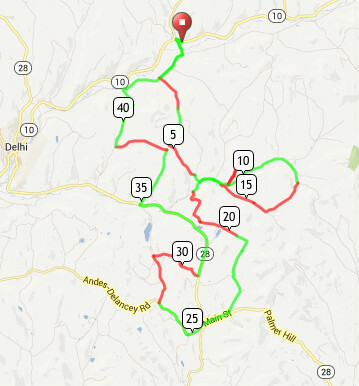 (I later learn when mapping it online that the 45 mile route has 5500 ft of elevation gain– see route link at the end). 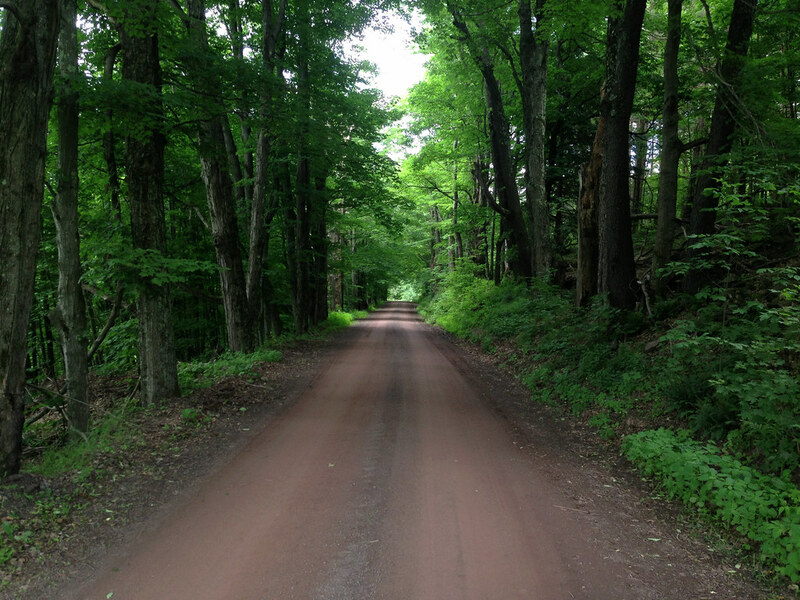 Doig Hollow Rd is a gem. Lined with sagging, mossy stone walls, tall ferns and century old trees, the shade is more than welcome– it’s needed. It’s high noon and I’ll later learn that it’s 87 degrees. I take a break, have a bite, a drink. 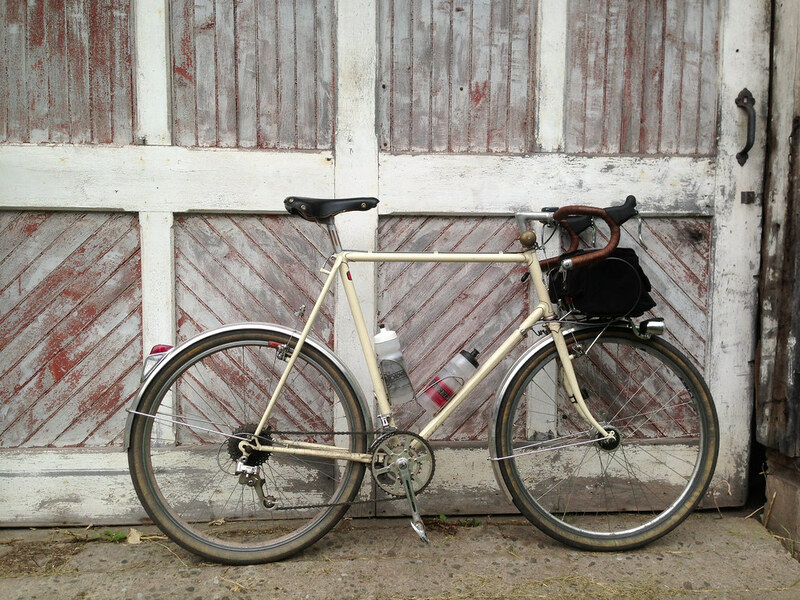 I’m a fan of front rack-mounted randonneur style bags, and mine holds enough food and supplies for a day in the saddle. But I’m nearly out of water and I’m still not certain how much more elevation I’ll have to deal with before I descend into Andes. Doig Hollow Rd went on like this for a while, then after a few milder climbs over two miles, it seems like the world is unfolding in front of me: a panorama presents that literally forces me to stop and take a deep breath. In the photo below, you can see the village of Andes in the distance. All down hill from here. The dirt changes to pavement, I hit 43 mph. I think, technically, I am speeding. The road terminates at NYS Rt 28, the major corridor through Delaware County. Fortunately, I join Rt 28 just as it enters the village and slows to 30 mph. Rt 28, which runs right through the village of Andes, is its main street. New Yorkers heading into the Northern and Western Catskills pass through Andes, and in the past 20 years it has become a tourist’s haven. 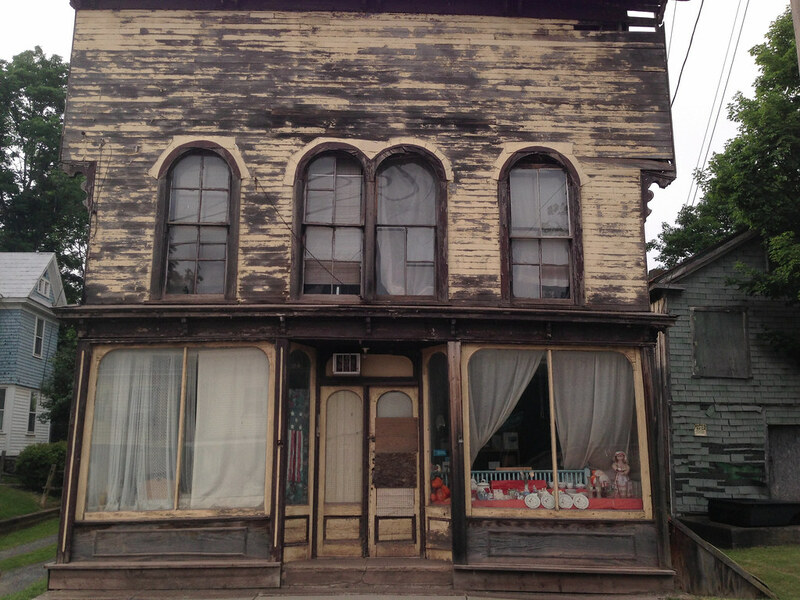 What were once feed stores or small engine repair shops are now antique shops or art galleries. We once bought a used lawn mower in Andes for $20. Today I can buy an early American pine farm table for $1200. I stop at Woody’s Country Kitchen for ice cream. I remember it from decades ago when it had a different name (Patty’s Pantry), and I discover that although the name had changed, the interior decor hadn’t. Next door is a boutique shop, the proprietors of which my family has known for years. I stop in to say Hi, in what has become an annual ritual. Inside, I meet a fellow who seeks me out as the owner of the bike resting against a post outside. He notes my Gilles Berthoud saddle– both he and the saddle are French. He’s a cyclist, grew up not far from the Alex Singer shop in a suburb of Paris, and happens to own an Alex Singer… and a Rene Herse. And he lives, as the crow flies, less than two miles from my house in Bloomville. Amazing. To complete the loop from Andes back to Bloomville avoiding the traffic of Rt 28, I head west out of Andes on County Highway 2, also known as Cabin Hill Rd, with the intention of hooking up with two separate passes, delivering me back to Back River Rd near Bloomville. Highway 2 is a paved, rolling road with a 55 mph limit, but traffic is very light, the scenery bucolic. One initial hard climb out of the village, and familiar views open up: fields, barns and distant hills, a horse farm on my left. The only building I encounter is a caving barn. The pitch steepens and I enter a hairpin turn. I can continue straight ahead as my map indicates, but there are signs that say Private Way. Instead of continuing with my original plan, I follow the hairpin (a 15% climb on loose gravel), barely maintaining traction. The road straightens out and I enjoy a brief respite from climbing. This is my second mistake: I think I’m still on Bigger Hollow Road heading north toward Bloomville, but the hairpin turns into Calhoun Hill Rd, which banks east back towards Andes! I had hoped Bigger Hollow Rd would take me to Rt 28 just a few hundred feet from the next mountain pass, but instead Calhoun Hill Rd dumps me onto Rt 28 about four miles south of where I thought I’d join it. It turns out the direct route that would take me north, avoiding Rt 28, is in fact a private way, but my map does not make the distinction. Oh well, I’ll just take Rt 28 north to Lee Hollow Rd, the last mountain pass of the route. Rt 28 is actually quite scenic, but it’s littered with billboards, has lots of truck traffic, and the shoulders are narrow. I don’t recommend cycling on it for extended stretches, not when there are so many better alternatives. 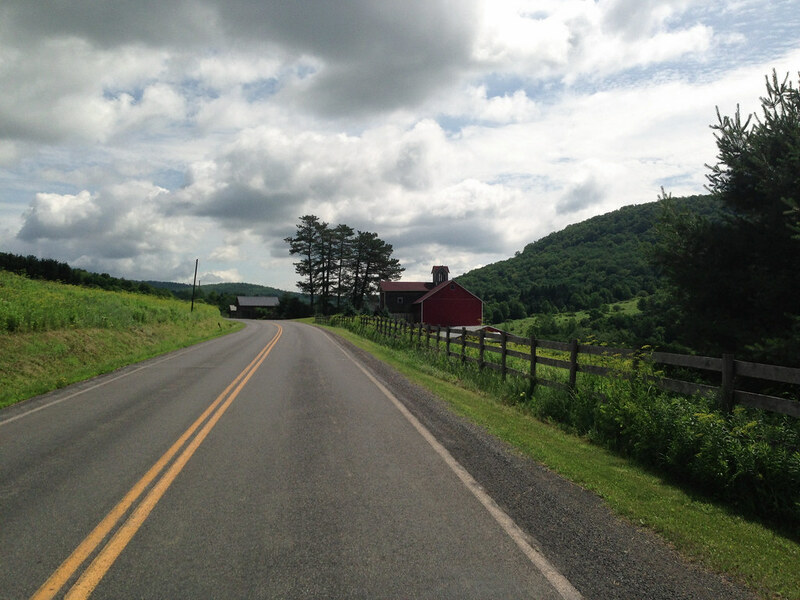 The red barn in the photo below, taken from the shoulder of Rt 28, is part of a farm in its fourth generation of operation. The previous generation’s owner, in addition to being a farmer, was also a real estate broker, and it was he who sold my parents their property. He and his wife thereafter remained close family friends, we used to see them at the weekly Bovina auction. 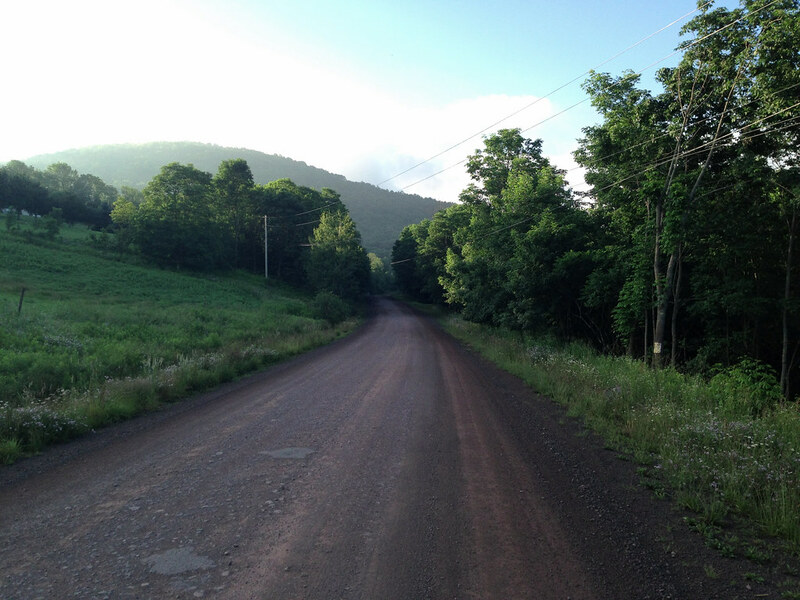 I follow Rt 28 to Lee Hollow Rd, which I believe to be the final pass before Bloomville. This one’s paved, the climb up it is hard, and the westerly sun is searing my back. It occurs to me that pavement radiates more absorbed heat than dirt, and I feel it. As I reach the top, I see in the distance that, in fact, there’s still another hard climb awaiting me. That’s got to be the last one, I think– I’m getting tired at this point. 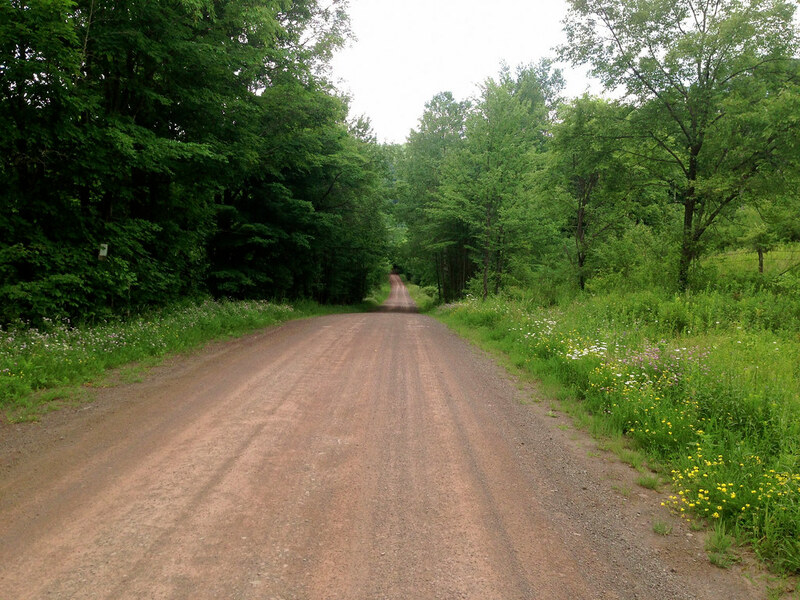 I reach it, and look forward to another short carriage road which, according to my map, runs fairly flat along the top of Bramley Mountain, and connects to Glen Burnie Rd, following another mountain pass that will take me back down Bramley Mountain to Back River Rd. I make the turn onto Huff Rd, the connector at the top of the mountain. Another gem. Shady, narrow, tall ferns, a joy. But why am I going downhill in the opposite direction?! This shouldn’t be. Well, the thrill of the descent overwhelms me and I bomb down it anyway. It T-intersects Glen Burnie Rd as expected, but now I have to climb up a short stretch of Glen Burnie before starting the descent to Back River Rd. Glen Burnie is in rough shape. Originally dirt, at some point it got paved, but now it’s crumbling, pothole ridden, the underlying red dirt layer blistering through the broken pavement like flesh wounds. I’m exhausted by this point, and lack the confidence to bomb down it. I have to brake hard the entire way down, and my fingers are aching and weak. Glen Burnie reaches its steepest—over 16% grade—just as it T-intersects Back River Rd. The KoolStop brake pads are squealing as the bike lumbers to a stop. The front rim is hot to the touch. The climbing is over. 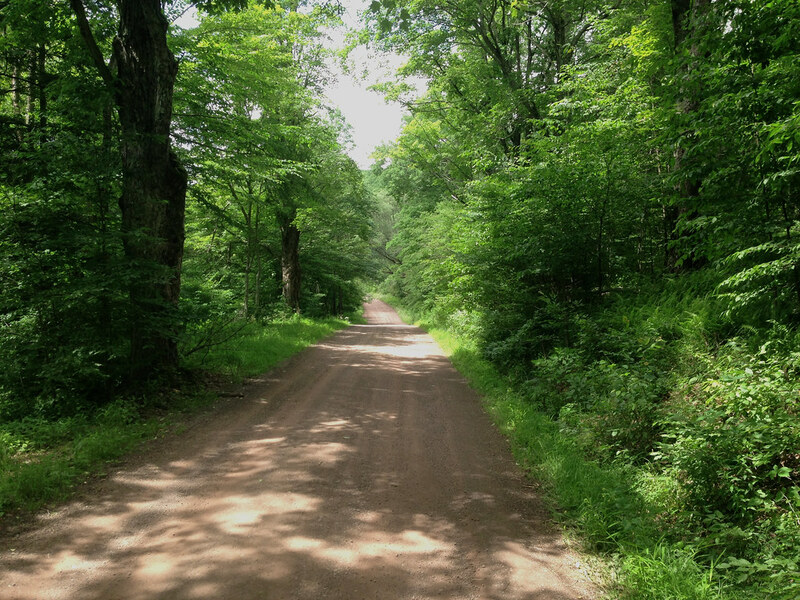 Finally back on Back River Rd, I regain my bearings and leisurely head back into Bloomville. The Delaware on one side; fertile, rolling farmland on the other. The gentle rollers help me cool off, a good way to wind down the ride. This final stretch provides a sort of catharsis for me. Back in Bloomville, the rustic cafe/inn that opened last year at the crossroads of the village, where I hope to get a cold drink, has closed for the day. It’s in a tall old house, vacant for decades, possibly a generation, its windows like tired eyes overlooking the heart of the village. 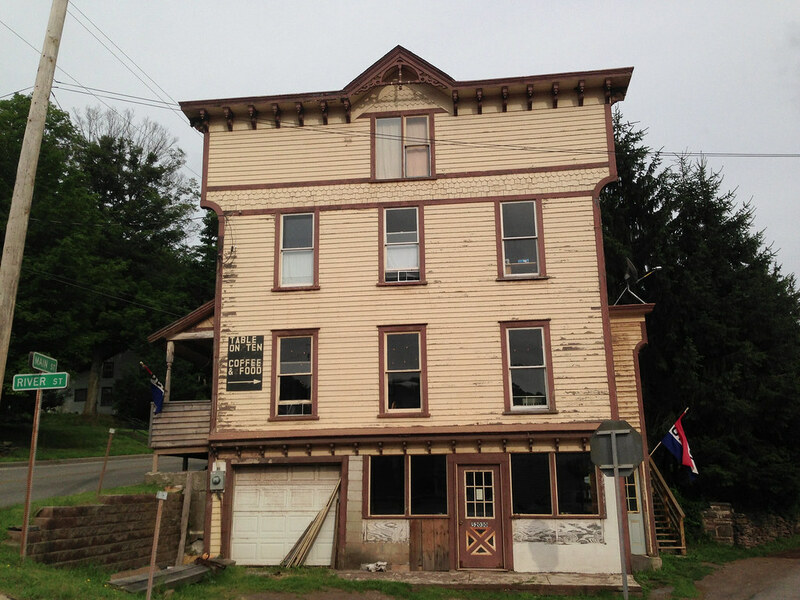 The new owners are giving it the rejuvenation it deserves. The cafe espouses a collaborative business model, sourcing its seasonal menu locally and hosting periodic food-related workshops and a weekly farmer’s market. 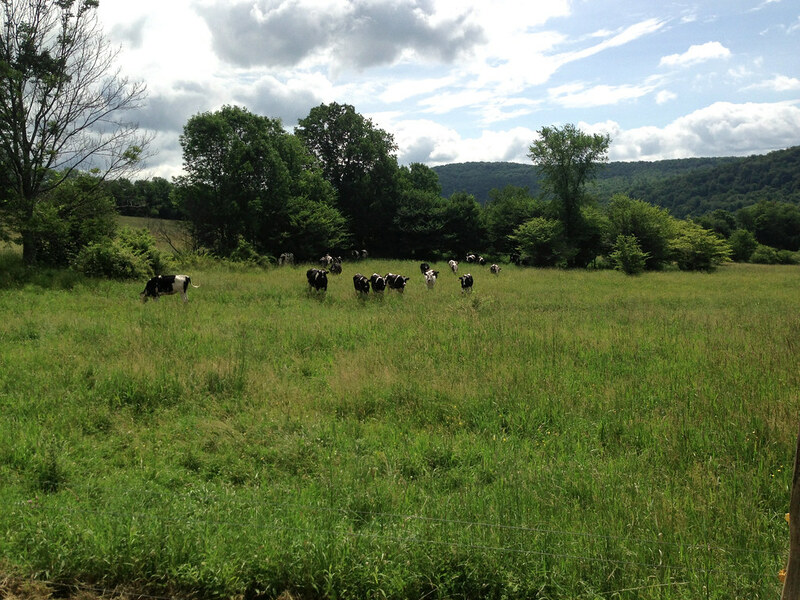 While not an entirely unique model–it’s sprouting elsewhere in the Catskills as well–I’m happy to see the new movement taking root in my village, I hope it helps reinvigorate the local farming community. 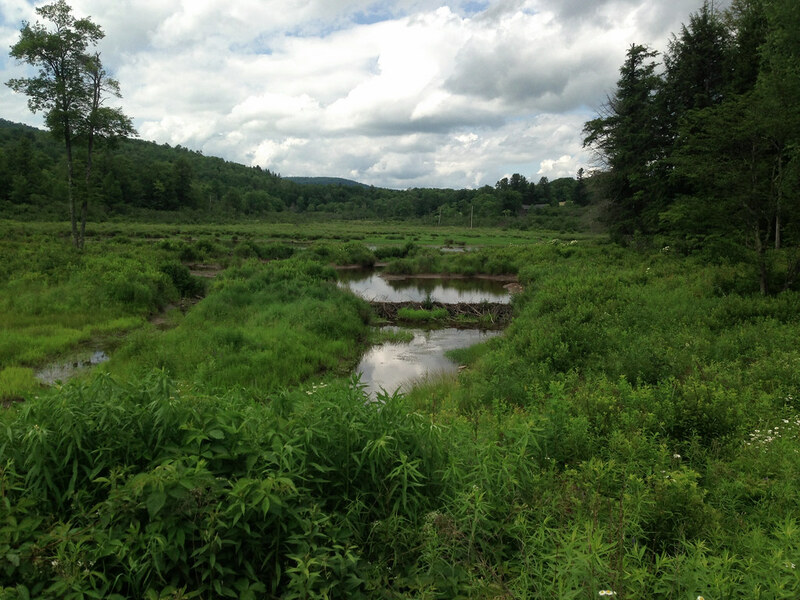 And its proximity to the Catskill Scenic Trail makes it a perfect stop before or after the ride. And once again a thoroughly dirty bike. She’ll get a proper wash back in Boston next week. Full route here, with dirt sections drawn in red. 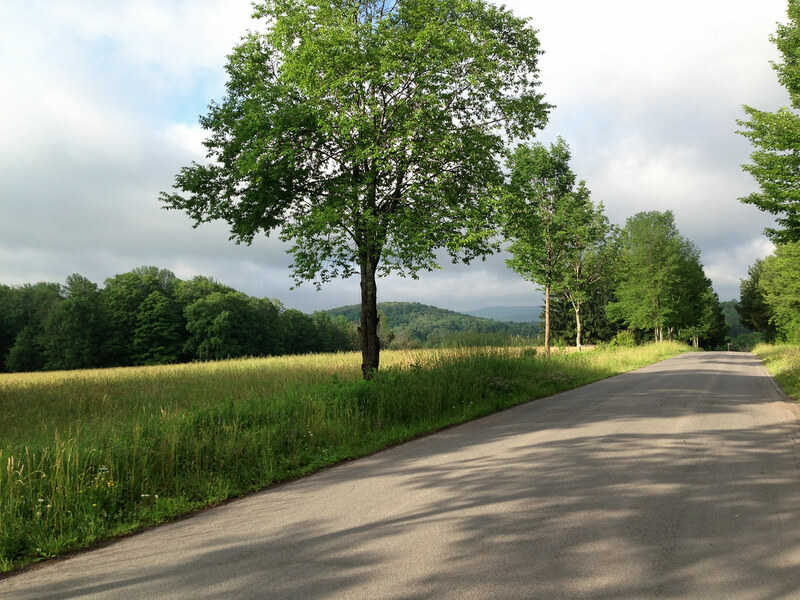 This entry was posted in bicycles routes rides, catskills, guest posts, rides, routes, Worth the trip and tagged Catskills Cycling Bicycle Routes, Cycling photography on July 15, 2013 by somervillebikes. For some reason, neither the title nor the tags are showing in my previous post. Plus WordPress has lost my formatting. Let’s see what this looks like. Fixed the titles and tags. Now can I have my formatting back? I don’t like this font. 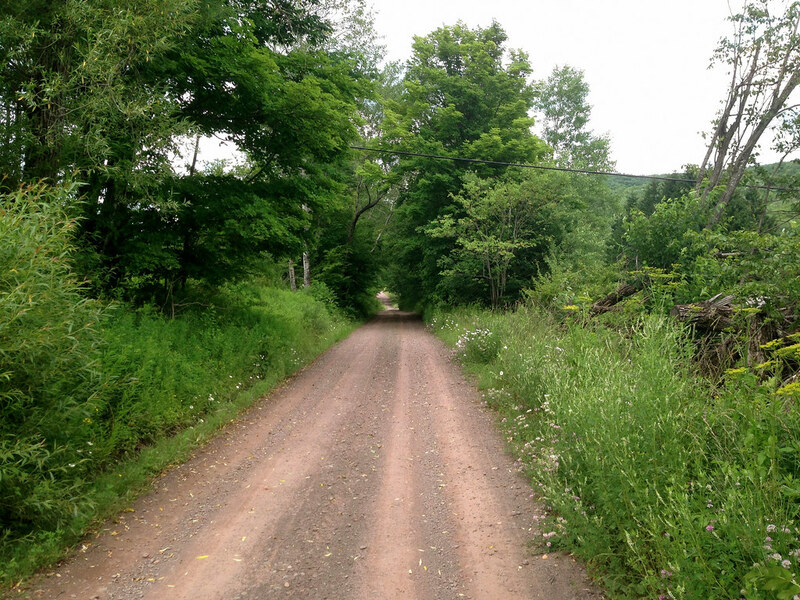 This entry was posted in 650B, bicycles, bicycles routes rides, Cameras, catskills and tagged Catskills Cycling Bicycle Routes on July 15, 2013 by John Ferguson.